We would all love to win tablets. Here is Samsung's entry up for grabs. 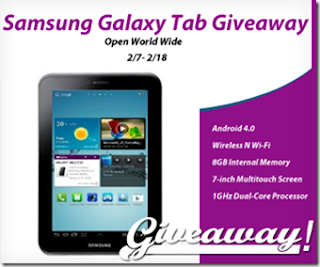 Win a Samsung Galaxy Tab! 165 Bloggers and Brands have joined together to bring you this amazing giveaway event! Who needs a closed-world iPad when you can use an Android-based Galaxy Tab. 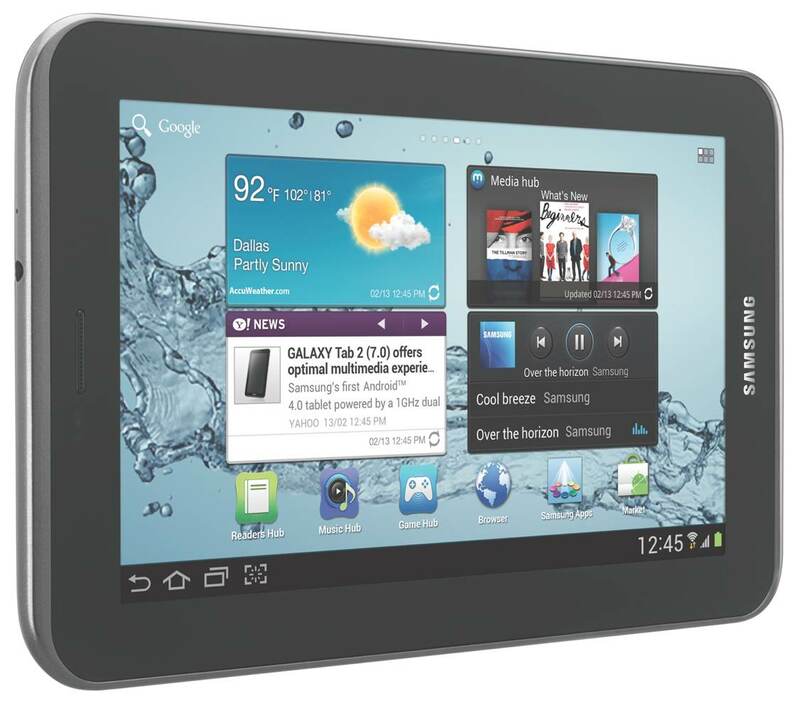 Keep yourself entertained at home and on the road with the Samsung Galaxy Tab 2 (7.0). Weighing just 12 ounces and sporting a vibrant 7-inch touchscreen display, the Galaxy Tab 2 runs the Android 4.0 ("Ice Cream Sandwich") operating system and is powered by a 1.0 GHz dual-core processor to help you achieve maximum usage across various demanding applications. Exceptional 7-inch multitouch screen designed for reading books and magazines, watching movies, playing games, and more. (view larger). Access the Internet and stream media over your home network via ultra-fast Wireless-N Wi-Fi. And with the Smart Remote app and built-in IR Blaster, you can watch and control your TV content--all from the palm of your hand. The Galaxy Tab offers full support for Adobe Flash Player 10.1 for accessing Flash-enabled websites, watching video and playing games. Designed to fit in one hand, typing messages or notes is simple and easy with the Galaxy Tab's virtual QWERTY keyboard. It's outfitted with a 3-megapixel rear-facing camera for photo capture and sharing as well as a VGA front-facing camera for video chat. Other features include 8 GB of internal memory, microSD memory expansion (for up to 32 GB of expansion via optional cards), Bluetooth 3.0 wireless connectivity for hands-free devices and stereo music streaming, and GPS for navigation and location services. With the Android 4.0 OS (aka, Ice Cream Sandwich), you can enjoy the most ramped up, up to the minute features and multitudes of apps supported by new the ICS technology. You'll get an evolved, intuitively designed UI that transitions seamlessly across all your applications, plus enhanced web browsing, faster overall response, and easier accessibility to preloaded Google Mobile apps including YouTube, Google Search, Maps, and more. With integrated Google technology, the Galaxy Tab 2 brings one-touch access to the popular Google mobile services millions use every day, including Google Search, Gtalk, Google+, and contacts/calendar synchronization. And through Google Play, you'll get access to thousands of useful applications and fun games to download and install on your tablet, with many more apps being added every day. Open world wide: Winners outside the USA will receive the cash equivalent via Paypal or Amazon winners choice. NO EXCEPTIONS! You must be 18 years of age or older to enter. See official sweepstakes rules. I'd love to win the Samsung Galaxy because I love the screen size and I need one. My tablet broke, this would be a nice replacement. I'd love to win this tablet because I never had one before. Don't have a personal pc or laptop, so this would be great. I would love to win because I have heard great things about the tab. hahaha if I won a cool phone like this, I just might break down and actually USE a cell phone!! I would like to win this for my husband who has been drooling over this! I'd like to win so I can share it with my family. like to win because i could definitely use a tablet, and so could my hubby. I would like to win it & give it to my son. It's make it easier to enter sweeps on this!